I’ve lived in my small town for a while now, and have continually been impressed every time I go see I Heard A Lion (myspace, facebook, twitter) perform. Not to mention the guys are friends of mine (and their newest member is my husband). This summer (or was it spring?) The band headed up to Kansas City and holed themselves up for a few days and made an EP. TONIGHT is the night… the EP release party/concert/jam/free nachos night. 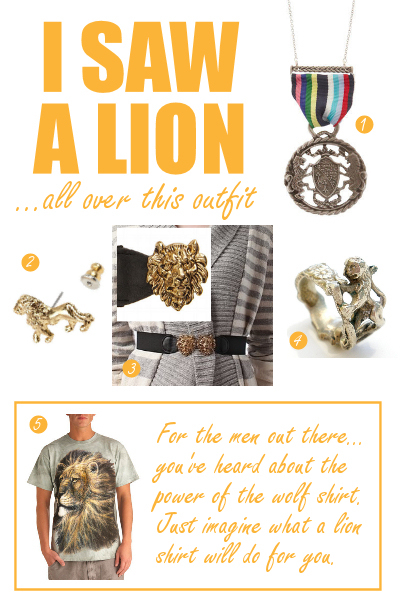 In celebration, I have whipped up this board of lion wearables to show my lion pride. (Get it? Pride? That was totally unintentional I swear). 1. Cute of Arms Necklace by modcloth. 2. Gold Lion Earrings by modcloth. 3. Deena & Ozzy Lion Head Mid Stretch Belt on Urban Outfitters. 4. Golden Lion Ornate Spoon Ring by plumbpretty (personal fave of these 5). 5. Mane Man Tee by modcloth. The caption isn’t funny unless you know about the power of the wolf shirt.